Greenfield Villa. A wonderful 3 bedroom villa on this newly completed western built development. Set amongst other similar family homes all with nice landscaped gardens. Respected as a very secure village with CCTV, and security guards 24 hours per day. This is a nice family environment, safe and clean with a central communal pool, childrens playground and eating area making it an ideal family home. The house comes fully furnished, plus includes a fully fitted European kitchen, fitted bedrooms, and bathrooms all with hot water. 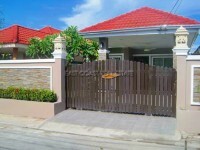 The house is held in a Thai name, with tax and transfer fees paid by the buyer.